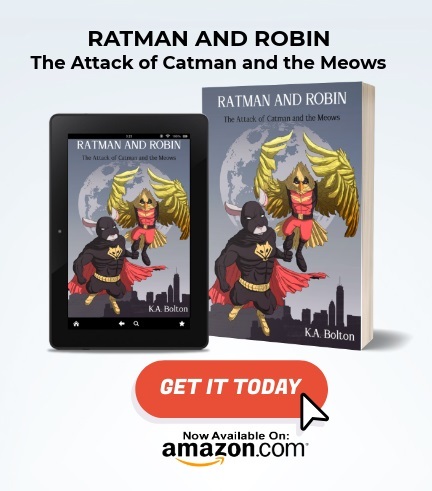 What is Ratman and Robin: The Attack of Catman and the Meows? 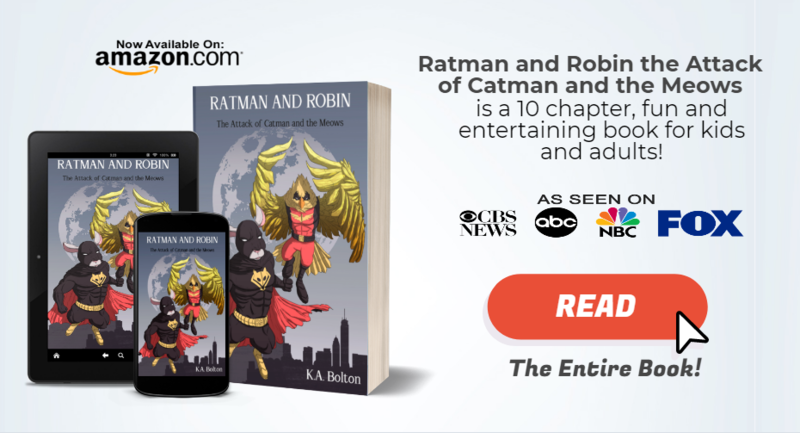 Ratman and Robin: The Attack of Catman and the Meows is a 132 page, 10 chapter children book written by author K.A Bolton. It is a superhero fiction book packed with action, mystery and humor, all within the right proportion. It is written in third person, in an easy to read format. The book can be read by both children and adults. 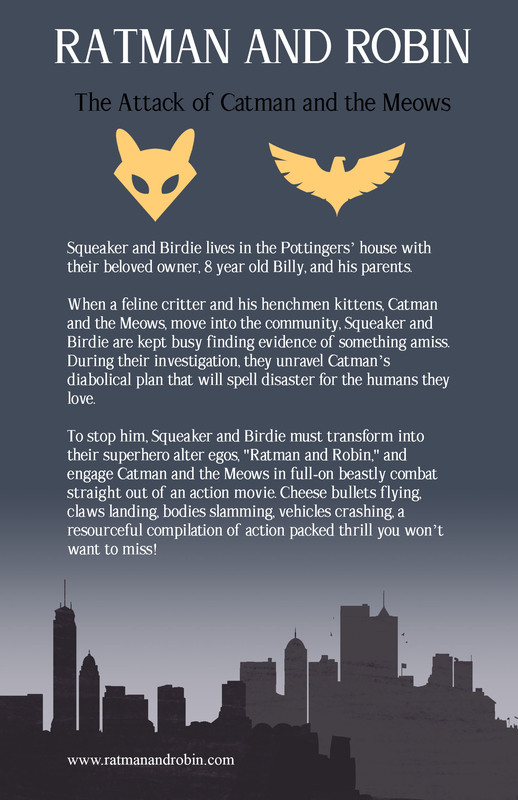 When Squeaker and Birdie, suspects that Catman and the Meows is up to no good they transform into Ratman and Robin and take on Catman and the Meows in a beastly combat. Each encounter between the beasts leads from one action packed episode to another which leads them to unraveling the diabolical plot of Catman and revelation the devastation to come. I saw this book a few weeks ago on Facebook and I was captivated not only by the cover of the book but also by the title of the book. The entire presentation of the book peaked my interest and curiosity. So I bought the book on amazon. When I read the book it was so much more than the cover, the cover could not prepare me enough for the experience I was about to have when I read the Ratman and Robin book. 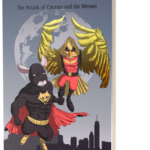 My experience with reading the book pushed me to write this review of the Ratman and Robin: The Attack of Catman and the Meows book. I was really in awe of the K.A. Bolton’s writing style, thoughtful expressions, very very detailed description and word usage. I think he did a great job of writing the story in a way that you can see in unfold visually as you read. And he has a great sense of humor as well. He really gave the characters their unique personalities. I cannot talk enough about the development of the story, to be honest, it does start of a bit slow but it kept my interest, it has enough substance to keep me interested as I read. I have to applaud K.A. Bolton for that. Once the story progressed it got more and more exciting, intense and interesting. One of my favorite parts was when Squeaker and Birdie transformed in to their suits. It was like a scene from a Movie. I could see Ratman and Robin on the big screens one day. I also liked the conclusion of the book. One of the most difficult things to do is to end a story properly and I think the author did an excellent job with bring the story to an end, although I didn’t want it end :(. 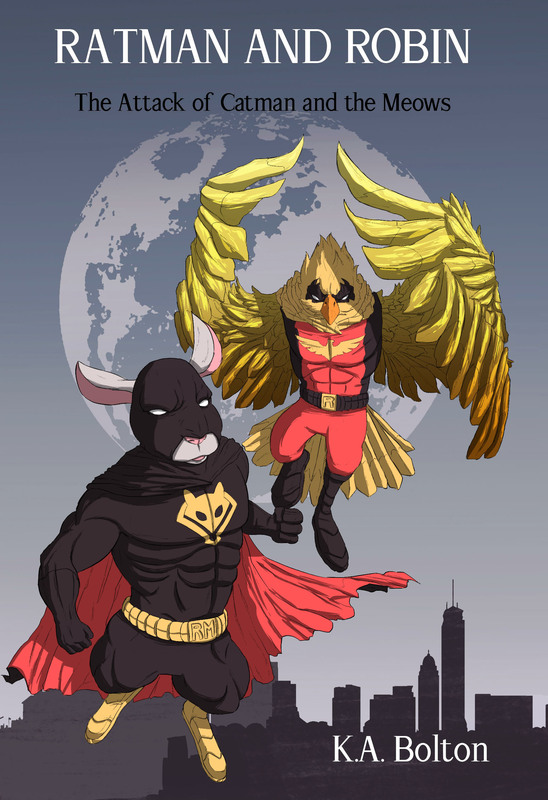 The good news is, the author is working on a second book for Ratman and Robin. I’ll be the first to get it when it comes out! What I also liked about this book was that there were a few things we could learn from in. In the book I saw the relationship between Squeaker and Birdie and the Pottingers and how much an animal loves unconditionally and will stand in place to protect it’s owners and vice versa. It gave me a new perspective of rats and showed how smart they are. This book gives animals a voice and a look into their world and perspective. It allowed me to see that animals too have emotions and their feelings matters as much as a human’s feelings does. There is also a lesson that even the underdogs can be heroes. I honestly can say that there is nothing about this book that I disliked. I am searching for at least one thing bad about this book and I can’t find it as yet. 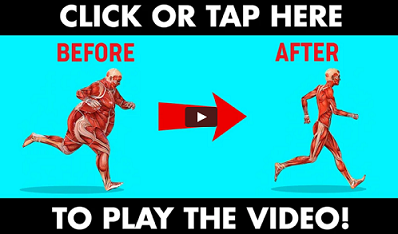 When I do I will update this post. Ratman and Robin: The Attack of Catman and the Meows is definitely worth it! If you are looking for something that you could enjoy, have a good laugh with, stimulate you mind and imagination, and has a no non-sense storyline that you and/or your children can enjoy, then you should definitely get this book. It’s a book that I’ll read to my kids (when I have one), but for now I’m reading it to my nieces and nephews and recommending it to my friends and family. Truth be told, I am not an avid reader and I find reading kind of boring, so this book must be something special for me to be recommending it and wanting to read it to my future kids.